With this 52 Week Money Saving Challenge, you can save almost $1,400 in one year! 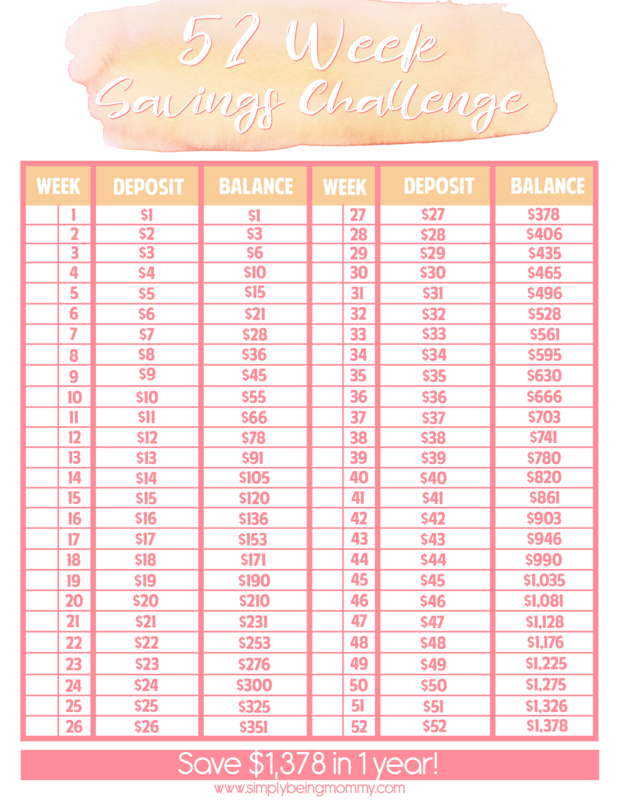 Print out this free 52 Week Money Saving Challenge Tracker and get started in the new year. There was a time in my life when saving money wasn’t even on my radar. But as I’ve aged and grown wiser, saving money is something that my husband and I try to do on a daily basis. We realize that the unexpected happens and we like to be prepared when those occasions pop up and surprise us. I think this is such an important topic for all us because we all have those unexpected things that happen, unfortunately. I know early on in our marriage money was a source of stress and often caused us to lash out at each other. One of those unexpected things would pop up and cause an issue with other bills we had to pay or other things we wanted to enjoy and it was a source of contention between us. I remember the day when I had just had enough of it and I decided to change it. It was a long, hard journey, but a necessary one. I look back and see how far we’ve come and I’m truly amazed at where we are today, simply because saving money is one of our priorities. We started putting away money in savings and our relationship completely changed. With our safety net, when those occasions arise, we don’t have to worry about not being able to pay another bill or have to put off something we want to enjoy. Our issues with money are few and far between simply because we save. For us, being able to save money and put money aside for those rainy days has proved to be one of the best decisions we’ve ever made. I know many couples that struggle with money and I hate to see the burden it puts on their lives, but especially their marriages. I know the struggles and frustrations that money can cause and I want to be able to share what worked for us in hopes that if money is the issue, you can resolve it easily with this 52 Week Money Saving Challenge. The best part of this 52 Week Money Saving Challenge is that it’s manageable. You start by putting away just $1 and by the end of the year you’re able to save a whopping $1,378. What do you say? Will join us in 2018 for the 52 Week Money Saving Challenge? 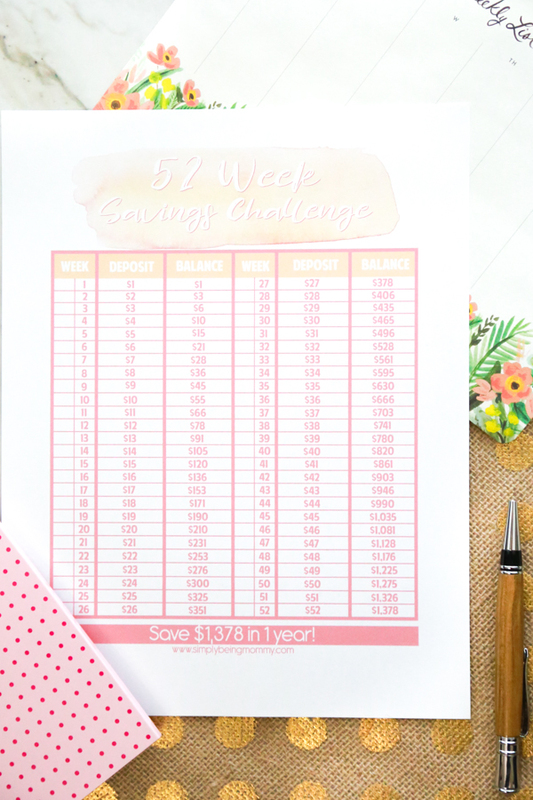 Don’t forget to print your FREE 52 Week Money Saving Challenge Tracker to get started! I think I need to do this again. I did it a few years ago and it went towards our vacation. After realizing how expensive this Christmas will be I am sorry I didn’t do this sooner. I must start one for the new year! This is a great idea! When you break it down like that, it makes it much easier to save and far less daunting. This is a great challenge. I need to do this in the new year. I love how it’s broken down to make it easy! My husband and I were talking about how we can get the family to start saving. This would be a great way to do that! I have seen savings plans similar to this one before and I would like to give yours a try. It can seem so intimidating to save money sometimes but this makes it easier to get started. This is really really neat. I am going to try this actually! We really need to do it.